Where should I sell, Amazon or eBay? The answer we’re all dying to know. I have seen this question floating around the internet for a while now, so I thought I would look into this a bit more as I was intrigued. Really, what is better? There are arguments for either side and I’m eager to get down to the nitty-gritty and see who comes out on top. So let’s break this down into pros and cons, shall we? First, let’s focus on eBay. Trusty ol’ eBay. Its been around for a while. Since 1995 in fact, it’s almost as old as me. I remember my dad being obsessed with eBay, finding all sorts on there and having the most random things turn up on our porch, one of them including a 15-foot swimming pool, which I was over the moon with. I did end up spending the majority of that summer in that thing! This is the first pro to selling on eBay, it’s great for buying and selling pretty much ANYTHING. And when I say anything, I mean almost anything! (Obviously illegal items are prohibited!) This ranges from brand new to used items. This is where eBay really comes into its own. 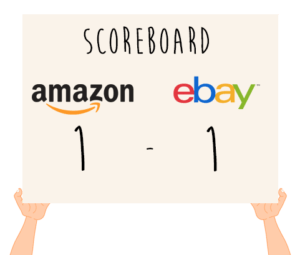 People love eBay for buying second-hand goods, compared to Amazon, even though you can buy used items on both. eBay is definitely the preferred choice here, as the auction model lends itself perfectly to selling used goods, and offers competitive prices. Having said all of this, it is still worth bearing in mind that when you sell something on eBay using the auction model, you don’t have much control over the price and ultimately, your profit margin. On Amazon your price is fixed and set by you, so you have full control. You can also run fixed-price listings on eBay too, but it’s worth remembering that the eBay shopper is out for a bargain! I would personally say that if I were to look for a pristine, new item, I would gravitate towards Amazon to purchase that product and if I were to want a secondhand item, I would go to eBay. Both could work in your favor, depending on what business you are going for. Are you making your business out of finding second-hand items in your garage and rifling through your friends and relatives lofts? Or are you wanting to sell brand new items? This is a choice only you can make, and what suits you best, but I personally think each marketplace has a clear purpose for both audiences here. 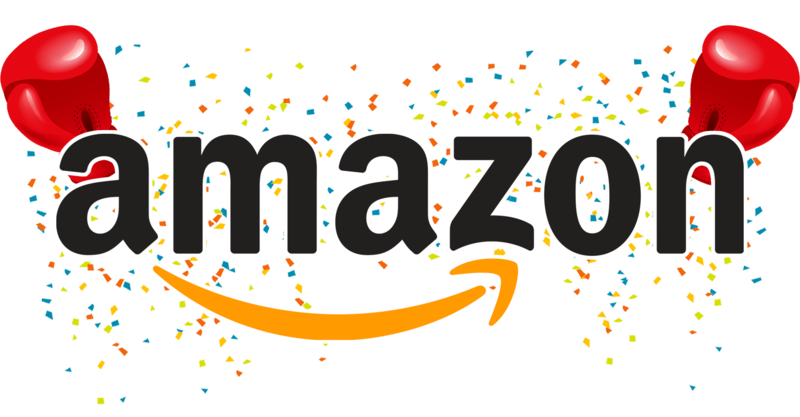 Overall, Amazon is a place to sell high-quality products that will make you money throughout the year. If you do your product research right, and if you get your sourcing right, you can make a killer profit year after year from the exact same high-quality product. Take our Jungle Stix for example. You would think they would be a seasonal product, however, due to extensive research, we found this as a profitable product which in the end, paid off! Another reason why some people may gravitate towards selling on eBay is that the fees are generally cheaper than using Amazon’s FBA (Fulfilled by Amazon) service. Don’t get me wrong, there are fees associated with both marketplaces. But as the saying goes, you get what you pay for. Let’s take a deeper look at the comparison. This soon starts to add up. 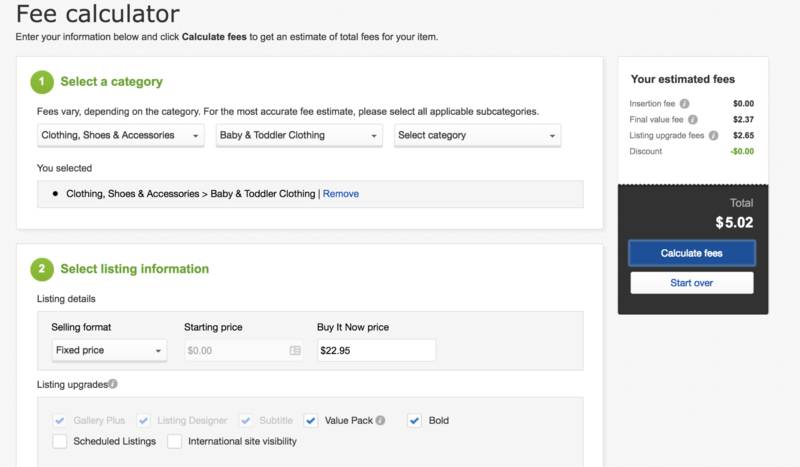 Take a look at this example here using the Baby & Toddler Clothing category and eBays fee calculator. For a product that sells at $20.95 as a fixed-price listing, with added listing upgrades, the fees come to $5.02. On top of that, we’d have to absorb the shipping if we wanted to offer free shipping to customers. Fees aside, eBay is a great way to get started if you’re new to the selling game. These fees are, overall, cheaper than Amazon’s fees. Just keep in mind that you will not be getting the package deal with eBay as you would with Amazon FBA such as getting discounted shipping, for example. On the other hand, with Amazon, your fees vary depending on the product you are selling. Let’s take our MDCS product Jungle Snugs, for example. It’s a product that fits the “good product” criteria as it is pretty cheap to store and ship because it’s not oversized or heavy. Once you take away the Selling on Amazon fees, which in this case is $3.14 (Inc Referral fees + Closing fees). Then your fulfillment by Amazon fees. This includes everything from storage, to packaging and shipment to the customer – in this case, it is $4.78 per item. Plus the shipping to an Amazon warehouse and the product cost itself. We are left with a net profit of $6.94. But the total Amazon fees were a little loftier than the eBay example, at a total of $7.92. 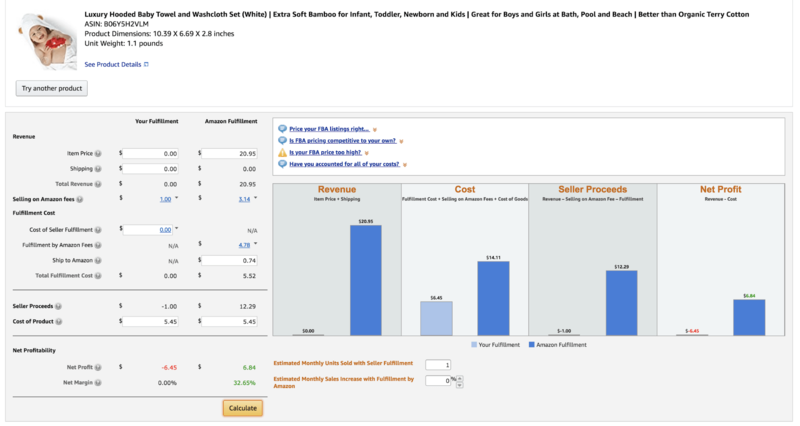 Read more about Amazon FBA fees and how to calculate them here! 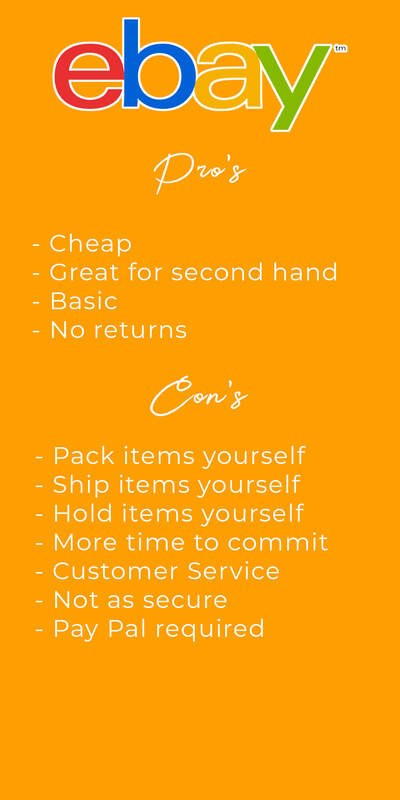 While this all may sound like a lot of money and a tad overwhelming, remember that if you are selling through eBay, you will be paying premium shipping prices, packaging your products yourself, which will cost more and having to store them. Depending on whether you rent out storage, this may also be more expensive. So Amazon may have the highest fees, but if you play your product research cards right, selling on Amazon can also be more profitable, more scalable and allow the most opportunity for freedom. Using the Jungle Scout Web App and Chrome Extension is exactly how I find the potential products that will give me a shed load of profit for more information on how to find the best product opportunities, check out the Million Dollar Case Study. True, but this is where you need to ask yourself if your time is worth the saving? Or are you selling so you have spare time? Only you can answer this question. 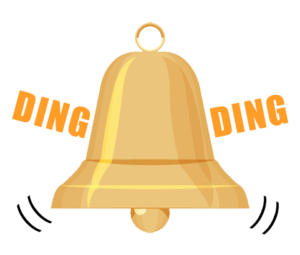 For time-saving, that will allow you to focus on growing your business and personal time, then selling on Amazon will win this hands down, due to the wonders of FBA. However, if you’re not too fussed as to saving time, and happy to get your hands dirty and put in the extra legwork, then eBay maybe for you? This point is going to eBay, purely because the fees were less (technically). But it is worth remembering that Amazon’s FBA fees are not a barrier and that given you find the right product opportunity, you can definitely make a lot of profit without ever having to touch the packing tape. Another reason why eBay may be seen to be the sellers choice is that it is a hell of a lot harder to receive returns and refunds. You can even tick the “no returns” box if you really want to make your life simpler. This is what unfortunately puts a lot of people off of selling on Amazon, due to their A-Z Guarantee. 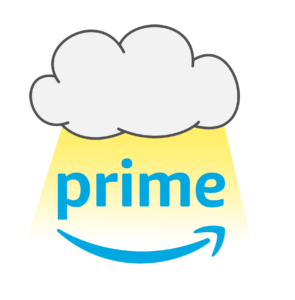 Don’t get me wrong, from a customer point of view, the A-Z Guarantee is amazing and is a core selling point of me buying from an Amazon seller, as I feel protected and secure. I also cannot be the only one, as do all of the other 304 million Amazon users, which is staggering compared to eBay’s 170 million. Let me ask you a question, if you were to buy something, would you buy it from a shop where you know they are reliable and secure or the shop that does not support you after purchase? The answer is easy for me. This is why Amazon has such a huge following, people trust it. You see that beautiful little orange arrow and think, “Ah, Amazon”. 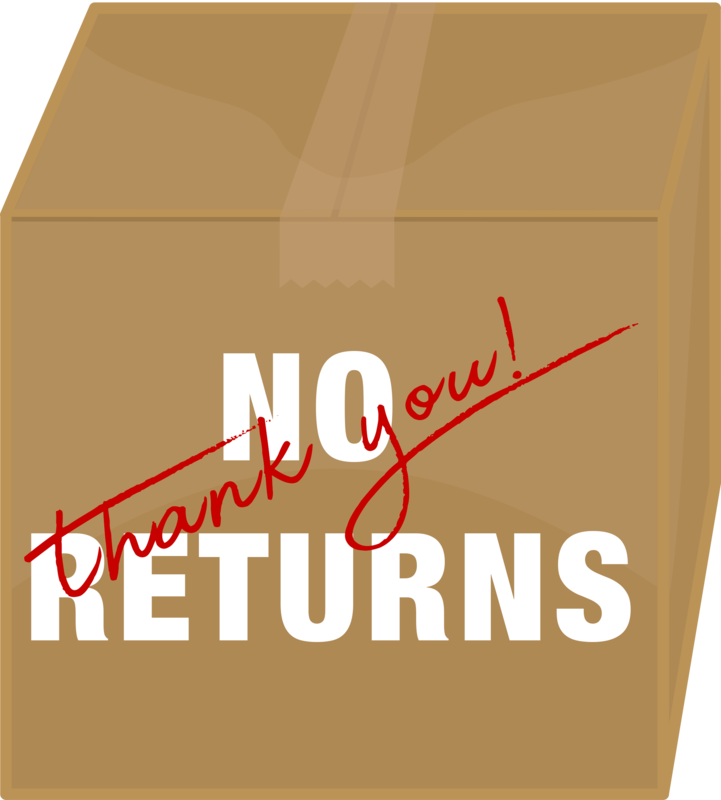 So you need to consider this, while not having to accept returns may be awesome from a sellers point of view, this dramatically reduces your audience. Is it really worth it? As long as your products are described to perfection and your photos are of a professional quality, showing off your product, you will then slash your chances at having lots of returns and refunds. Additionally, you should always discuss returns with your supplier and enter into an agreement where they take the cut if your returns are above a certain percentage. One feature that Amazon boasts of, that eBay really can’t compete with is the ever so wonderful Amazon Prime. I know people who can’t live without Amazon prime and will refuse to shop anywhere else. They will look no further to buy a product even if they know they could get in their car, run to the store and buy it themselves. Why? Because they know they can have it delivered to their door on the same day and most likely, cheaper too. This opens you up to 90 million dedicated, guaranteed customers in the US and 45 million internationally. I know right, that’s a crazy amount of people! And these people will be returning to Amazon, In fact, many of them shop with Amazon on a weekly or even daily basis. Why would you even consider selling elsewhere when you have this audience waiting for you, ready to click that one button (no messing around with PayPal here) and spend their money on your products?! of stress and time off your hands. I mean c’mon, they’re holding your stock for you, packing it and then shipping it, whilst you barely have to raise a finger. 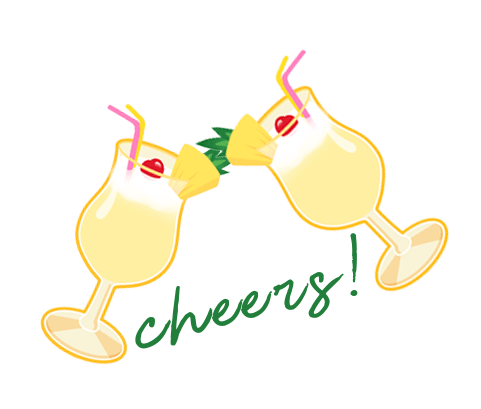 You could even be chilling out in the Bahamas on the beach, drinking a Pina Colada if you really wanted to, or even…I could go on forever, but you get the picture. Now, yes, you do have to pay a fee but as I touched on before, this is where you need to ask yourself if you time is important to you. Do you really want to be spending hours and hours going through all your products, labeling them and then packaging them? Then hauling them to the local post office to ship to your customers? For some, this may be the idea of heaven, for others, not so much. Yes, there’s a fee, but in my opinion, it’s totally worth it. Yes, eBay is cheaper. Yes, there is more freedom due to leaner rules and regulations, but this is what separates the two for me. You should always be thinking of the customer. What would they be thinking? How would they want their shopping experience? To me, Amazon wins this hands down due to their stellar customer experience. With 304 million active users, compared to eBay’s 170 million, you can access a massive gain on audience. Not to mention the dedication of Prime customers. Do I want to be packaging all of my products? No. Do I want to be shipping all of my products? No. Do I want to be storing all my products? No, and I think the other half would have something to say about that also! My time is worth everything to me. Whether that’s spending it with loved ones or planning my next business venture, it’s something that I just cannot put a price on. Amazon officially wins it for me hands down (APPLAUSE), however, I do think this is a decision that can only be made by yourself, your business and your business strategy. Take time to ask yourself these questions and figure out what would suit you best. Each marketplace has their own unique selling points. I do understand how people are drawn to either one and how it is easy to have a preference. Can ebay kick you off a listing if the brand tells ebay you can’t sell it? Or can a brand do an ip complaint about you selling their brand without their permission? Finally if either one of the previous questions is true, can you lose your selling privileges on ebay? I have no clue! Never used eBay more than to sell a few products. Yes however the problem with Adam is that their customer services is terrible to sellers. It’s beyond terrible. It’s possibly the worst customer service in the world when it comes to sellers. I’ve bought the Jungle Scout software. I’ve done tons of research over the last month. I found what looks like a good product to sell. It wasn’t a waste of time, but clearly, trying to deal with this insane brick wall of absolutely atrocious customer service, and I give up. It became crystal clear to me today that I could spend 1,000 years trying to get Amazon to give me a seller account, and they wouldn’t do it, because they have a rule that says once they’ve closed your account and it’s remained closed for a certain period of time, there is no act of God that will get them to reopen it. Amazon can go pound sand. I detest this company. Joe Smith, very worrying reading your story. I am a new seller from scratch, trying to learn up before entering into this field. Read so many positive story until yours. I think i need to study more before engaging. The one thing I like about ebay is you can produce your own quality of listing and photos, and add some personality to it. A lot of the times you simply put a barcode in on amazon and you list against a product amazon already have. So the advantage is you can list products a lot quicker, and for the beginner get started quicker, on amazon than ebay. The downside is you are listing against other suppliers so it tends to become a bit of a race to the bottom on price. Ebay is slightly cheaper than amazon, and if you become a higher rated seller you do get discount. The main difference I find is amazon will always back the buyer if there is a dispute, and as a retailer you are expected to pick up the loss, there attitude is you should be grateful you are selling on amazon. Whereas ebay I think tend to side with the seller, but are more even handed. This reads very biased towards amazon. The pro arguments on the final slate of amazon are unnecessarily blown up by listing “ownership of your products” twice! Plus adding a few points that are useless. Also, aren’t you owning your products on ebay, too? The hassle and huge $ loss due to with fba errors has been left out. In reality it is a big problem. The other hassle with having to babysit amazon so they reimburse you is another time consuming task. The third hassle or rather big risk is amazon suspending you at any time for any or no reason. The fourth hassle is fba tampering with your inventory. Amazon and Ebay are time consuming in different ways. Selling used items is often more interesting to me, learning the history/provenance of items, more personal buyer contact, getting out locally to source. At a small business level (under 100K) Ebay is more hospitable and doable to me. Amazon is frustrating to deal with. I pray I never have an issue as a seller where I have to contact Amazon, getting caught up in their nonsense of scripted responses that don’t make any sense and take days, weeks, sometimes months to resolve, if they resolve. Amazon prides themselves on being customer centric, but they forget that third party sellers are also Amazon customers who they often treat very poorly. Your listing (hardwork+money) can be hacked on Amazon by listing hackers, while your listing is guaranteed safe on ebay. Your article really does not tell enough of the details. Amazon charges 39.99 per month to be able to participate in FBA. The freight is not discounted much better on Amazon than it is on ebay. If you do not participate in FBA (professional sellers account) you cannot determine what the charge for shipping would be. Amazon dictates what the shipping shall be. On ebay the shipping can be determined for each and every item, their shipping really works. If you get an order to ship to California and one to Maine or Florida, they will all be calculated from your origin (Correctly) and will be different if the selected carrier charges differently. On Amazon, all orders have the same shipping, even the professional seller accounts. You end up shipping three orders out to three different locations and you only get the same shipping charge for each and every one of them. Good luck trying to get paid what the shipping really costs you the seller for most orders on Amazon. The only shipping that is consistent is if you use USPS Priority Mail. Small Flat Rate Box Priority Mail, $7.20, Amazon charges the seller $6.50, ebay charges the seller $6.50. Where’s the better deal? Previous comment mentioned Amazon blocking sellers from offering certain items which happens a lot. They add restrictions at times as they go. Some items must be certified as to material content. It’s not as simple to sell on Amazon as this article made it seem. And the withholding of funds does go on for some time, longer than PayPal. Refunds are definitely a problem on Amazon as they honor products that are damaged from misuse and not from any defect. Yes the buyer has the A-Z guarantee, but Amazon passes the cost of that guarantee on to it’s sellers. Your writting needs to be updated. More than 80% sold on eBay is now NEW. There has been new improvements in past weeek and more to come. Oh I forgot you didn’t mention over half of Amazon is gated for new sellers. For the little guy, I still prefer eBay. I sell on eBay. I buy on eBay and Amazon. Many times I found the exact same new item, same packaging and maybe even the same seller and eBay had the better price and equal guarantees and shipping times. For us, this is not a rarity. 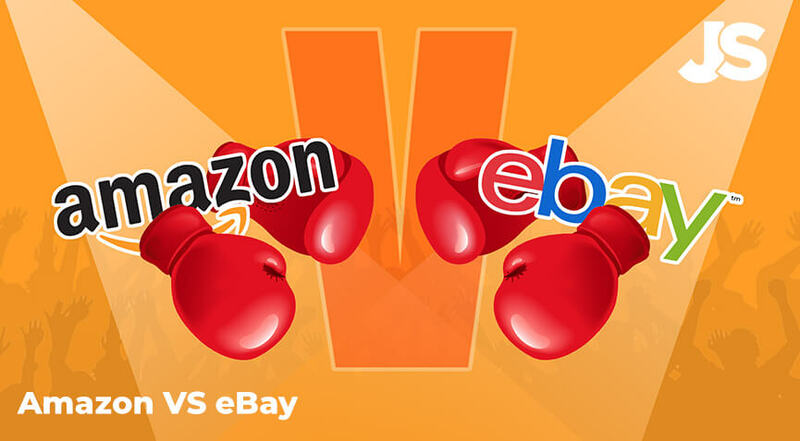 Big plus for eBay is that You are transferring money for fees to eBay and with Amazon You are that one who is waiting to be paid for. Amazon is quite often sitting on your money and you have to wait weeks and months to get your money from Amazon. Good insight, however you are incorrect about “weeks and months.” Amazon pays every other Wednesday. And they escrow your funds to account for fulfillment costs (which Ebay doesn’t have its own inhouse fulfillment), advertising so you don’t have to pay as you go and have a one time lump sum, and any refunds that Amazon will process on your behalf. The winner is Amazon, but only if you are buying from an authorized distributor and you can deal with all the scammers. Want to sell a name brand item, good luck as you will probably be blocked. Not new items (open box, used) eBay and Amazon are options if you are not blocked from selling on Amazon. This post forgets so much about selling on Amazon. It reads like it was 10 years ago when Amazon was easy. For the hobby seller, stick with eBay. Yes, Amazon is more advanced these days, although, still pretty easy if you just stick with the guidelines. Personally, I like Ebay more for buying wholesale products and selling “weird” stuff (I once sold a used breast pump and a Subaru owner’s manual on Ebay). And Amazon works best when you do your own brand, which, more or less, is what Amazon prefers to see versus selling someone else’s label and often competing directly with bib papa AMZ. Can you get kicked off a listing by because a brand complained your not allowed to sell their brand? or can they do an ip complaint to ebay and kick you off the listing that way and could that possibly make you lose your selling privileges on ebay? Thank you for solving our doubts where should I sell. I realize the point of the article was to pick one in the end, but the right answer for the majority of sellers would be, sell on both.